This dude was creeping around the kitchen and thankfully my cat got in the way of me stepping on him! Vincent earned a tuna dinner tonight. 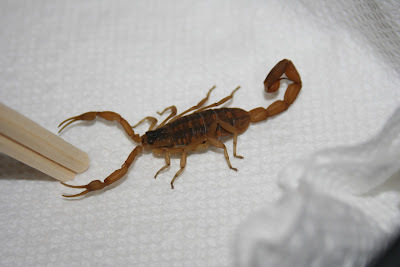 One of the representations for scorpions: Scorpions serve to remind us that light can be found within darkness if we channel our passions correctly. They also serve to represent death/rebirth/transformation. Hmmm, change is in the air?